This is a radball, or bikeball bike. Everything about the design of this bike denotes its use. It’s got a relaxed headtube angle, a 1:1 gear ratio, a tight rear end with the saddle cantilevered over the wheel, platform pedals and high bars. This bike is meant to whack a soccer ball with the front wheel into a goal while other opponents play defense. This is an artistic cycling bike. It looks very much like a track bike, sans the 0 degree stem and large back-swept handle bars. Like the radball bike, this bike also supports a 1:1 gear ratio. They look very similar in geometry in fact, except for the seat tube angle and saddle, which is traditionally inserted into the seat tube, versus the top tube. This bike is meant to be ridden in auditoriums where one or more rider performs synchronized, ballet-like manuevers. This is the Starfuckers Zenon frame. What makes this different than other Starfucker builds is the use of a 26″ wheelset. The rider now, along with the slack head tube able, has 0 overlap for barspins like the previous two bikes. 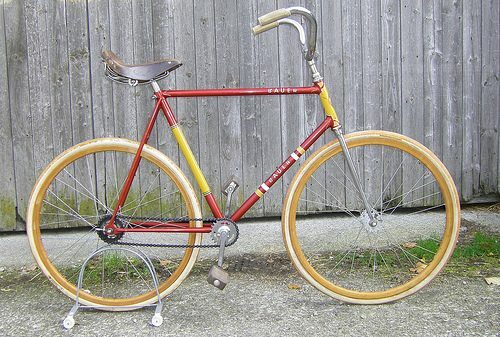 In fact, if the rear wheel were to be tighter to the bottom-bracket, this bike would wheelie like a Schwinn Stingray. Note the same flat pedals but a different saddle and a more traditional track bike gearing. 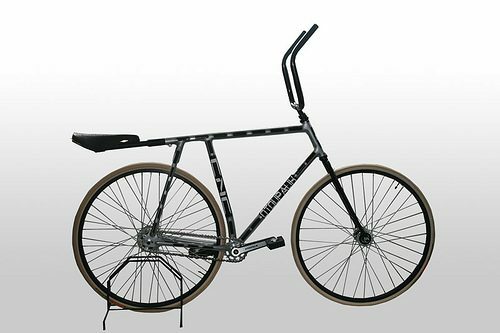 Now, this bike is most likely ridden around a city like Tokyo where the rider engages in the new ‘trick’ movement called ‘fixed gear freestyle’. We’re all aware of this, so I’ll spare everyone further explanation. 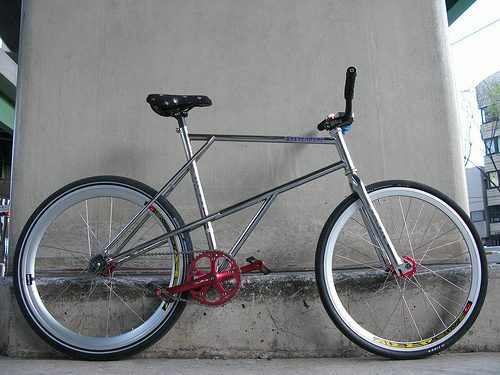 There are a few variations on what these freestyle fixed gear trick bikes look like. You’ve seen the Charge Scissor, the Milwaukee Bruiser, the Volume Cutter, the BMW Gangsta tracks and others. What differentiates these bikes from a radball or artistic cycling bikes is their ability to cover great distances in a short time. I’ve seen a lot of set ups that make tricks easier; BMX race bars, low gearing and platform pedals are a few. But what about the one thing that separates these fixed gear trick bikes from the rest? I’m not saying I oppose the set ups people are riding. In the end, people are riding their bikes, which is all that matters. I’m just wondering what these bikes will end up looking like in 2 years. Will people be merging into artistic cycling styled bikes? Or will the BMX approach take over? What’s your opinion on the subject? What kind of riding do you do and what kind of set up do you have on your bike? I’m interested in your opinion, so link pics to your ‘trick’ bike and explain yourself!